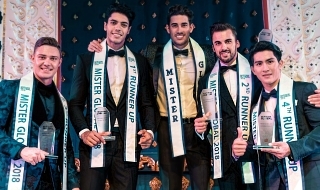 A 23-year-old Instagram model has been crowned Miss Earth 2018 at one of the world's largest beauty pageants. She becomes the first-ever Vietnamese winner of the competition, which is themed around promoting environmental awareness. Alongside Miss World, Miss Universe, and Miss International, Miss Earth is one of the Big Four most coveted pageants. Brunette stunner Khanh is a marketing student who is fluent in both Vietnamese and English. Khanh noted that she became aware of the Miss Earth pageant for the first time when she was 15, and said that it became her dream to represent her country in one of four biggest beauty contests in the world, alongside Miss Universe, Miss World, and Miss International. Khanh is a marketing student who is fluent in Vietnamese and English. She has stated that she is an avowed eco-activist. Nguyen was born and raised in Bến Tre, a coastal province located in the Mekong Delta in Vietnam. The region was the spotlight of her video for the 2018 pageant, as the Vietnamese beauty spoke about an ongoing project to protect the ecological resources of the Mekong river and those local areas which depend upon it for survival. 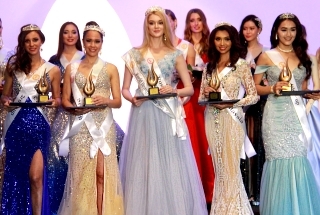 Instead of triumphantly facing the crowd after being declared Miss Earth 2018, Phuong Khanh Nguyen of Vietnam appeared to pull herself toward Austria's Melanie Mader to hide herself. 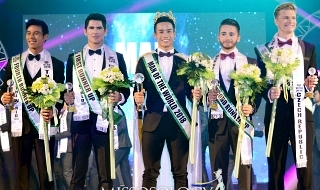 Nguyen won after telling her fellow millennials to stop using social media and technology for vanity purposes and "transform the world" in the pageant's question-and-answer round. Nguyen, a 23-year-old marketing student, beat a pool of candidates that included the Philippines' own Celeste Cortesi, who settled for a Top 8 finish. She advocates for maintaining and preserving Vietnam's rivers and forests as her country "transforms itself into an industrialized nation," according to her profile in the Miss Earth website. Miss Vietnam is Miss Earth 2018! Miss Vietnam Phuóng Khanh Nguyen is Miss Earth 2018. Congratulations! During the Q&A, she had the most substantial answer to the uniform question: "Being a millennial, what is the most pressing issue of your generation?" Miss Vietnam answered it was ignorance. "Our ignorance is the most pressing issue. We have technology available and we only care about ourselves." wow, dailystar in the UK acknowledges that there are only big four pageants in the world. That's a fact from UK! Now that's a legit major pageant!!! Happy for the winners, sad for Portugal and Peru. I AM VERY HAPPY. THE BEST ME EDITION EVER. Johannesburg – Former Miss South Africa finalist Margo Fargo owned the stage when she represented SA in the Miss Earth pageant held in the Philippines on 3 November. The beauty queen made it all the way to the top 12 of the competition, with Phuong khanh Nguyen from Vietnam eventually taking home the crown. “I would dream about this day and had no idea how it would happen. I had the time of my life walking for my country. I loved every moment. To have made it to top 12 is a mere position and no limitation. God is only getting warmed up,” Margo wrote on Instagram. Margo shared pictures of herself from the swimsuit round of the competition, gave us a look at her national costume as well as the beautiful evening dress she wore. Nu a contat numai aspectul pentru juriu, ci şi răspunsurile la întrebarea ”ce veţi face pentru a proteja planeta?”. ”Cea mai mare problemă a generaţiei mele este că suntem ignoranţi. Avem acces la atât de multă tehnologie, dar o folosim doar pentru social media şi pentru plăcerile noastre. Ar trebui să ne gândim mai mult la ce se întâmplă cu planeta noastră. Milioane de acţiuni, mai mici, pot transforma lumea”, a fost răspunsul dat de Phuong, care i-a cucerit pe juraţi. Acum, tânăra va călători în jurul lumii pentru a atrage atenţia asupra problemelor cu care se confruntă Pământul.